Thanks so much for making my daughters 7th Birthday so memorable. All the girls had a great time. Razzberry Lips was perfect for my daughters princess party theme because all the girls left feeling like a true princess. All the girls looked so beautiful when they left and they really enjoyed dancing. Thanks for giving the girls an experience to remember." "They had such a spectacular time! I have to say, the girls there went way out of their way for us that day! My daughter had almost her entire head braded, she wore it for a week afterward." "My daughter still talks about her unique experience at Raspberry lips, every time she sees a shopping mall she yells, Mom, Raspberry lips is in there, can we go?" 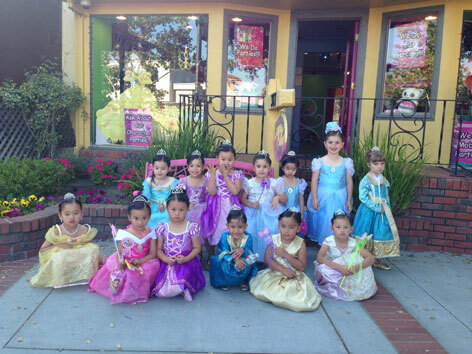 "We Recently booked a birthday for our 11 year old daughter at Razzberry Lips. She just entered middle school and was having trouble making friends. We thought a Diva party might solidify her place as "one of the girls" and it worked. Razzberry Lips provided more attention and care to our party than we've received at other party places. My daughter and her friends are looking for any excuse to return. My husband and I found everything reasonably priced, clean, organized, and just perfect for making memories. Thank you for helping Savannah's transition into middle school easier. Your new and loyal customers." "That was the best-ever Birthday party!" "That was my best party in 11 years!" "They had so much fun!" "Thanks for having us!!! By the way, we got a gold metal at our cheer competition... thanks again for doing our hair!"